Apple and IBM have announced a partnership to transform enterprise mobility by bringing IBM’s big data and analytics capabilities to iPhone and iPad. Once bitter rivals, the two companies will cooperate in a quest against Microsoft targeting businesses, producing a new class of “made-for-business apps”, cloud platforms and support services. The companies said in a statement that the partnership would combine IBM’s distinct strength in data and analytics with Apple’s customer experience, hardware and software integration and developer platform. This Autumn, the companies will begin releasing a series of apps targeting specific industry issues or opportunities in retail, healthcare, banking, travel and transportation, telecommunications and insurance, and others. A new IBM MobileFirst Platform for iOS will deliver the services required for an end-to-end enterprise capability, from analytics, workflow and cloud storage, to fleet-scale device management, security and integration. Enhanced mobile management includes a private app catalog, data and transaction security services, and productivity suite for all IBM MobileFirst for iOS solutions. IBM will also make these services available on its cloud development platform, Bluemix. IT departments will benefit with service and support from the combination of IBM on-site service and AppleCare for Enterprise, offering 24/7 assistance. Packaged service offerings will be available in the form of IBM MobileFirst Supply and Management, which will include iPhone and iPad supply, activation and management services with leasing options. Apple chief executive officer Tim Cook said the partnership would open large market opportunities for Apple. More than 98% of Fortune 500 companies and more than 92% of Global 500 companies use iOS devices, he said. Ginni Rometty, IBM chairman, president and chief executive officer said the partnership aimed to transform the way people work. “Mobility – combined with the phenomena of data and cloud – is transforming business and our industry in historic ways, allowing people to re-imagine work, industries and professions. 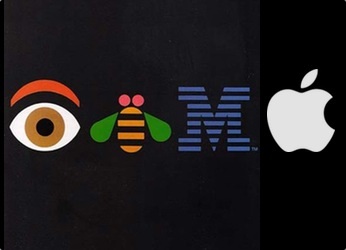 IBM and Apple haven’t always been the best of friends. 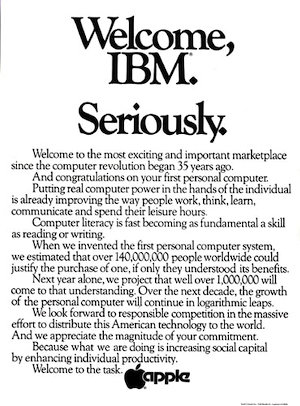 In 1981, Apple took out this full page ad taking a sarcastic dig at IBM. IBM has since changed its strategy away from hardware to focus on systems and services.